Here are a couple of pieces I did on James Ferraro over the last year that never made it into print. The first is a discussion I had with him in the summer, with no clue as to what was to come in the autumn in the shape of Far Side Virtual. The second is an enthusiastic review of the Bebetune$ mixtape that followed FSV, maybe attempting to make up for the fact that it had been too late to make the mixtape one of my releases of the year. I still think the Bebetune$ stuff hasn't been talked about enough. 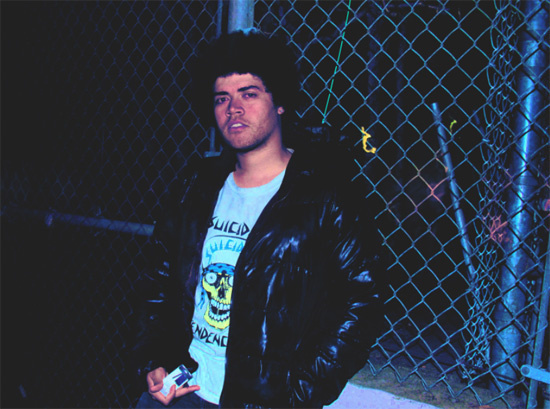 One of the most prolific and varied artists in lo-fi pop, James Ferraro has assembled countless worlds from the hopes, dreams and detritus thrown up by thirty years of US subcultural spirituality. He visits each of them using a collage of impressionistic fragments that ooze with memories and associations both personal and collective, sometimes switching suddenly and violently, sometimes evolving as a trance. Yet just as we think we pin Ferraro’s shtick down to a mere reminiscence of 1980s MTV punk rock camp or the rippling blue oceans of the New Age, we find that he uses this impressionism to tear open some trying questions about cultural consumption, identity, sincerity and embodiment, questions directed at the present regarding the future. The imaginary dates in the titles of his albums often position his quasi-documentary recordings in history, alongside which the linguistic quirks and references can tell a story – ‘Cruisin’ the Nightbiker Strip 1977’, ‘1992 Cool Runnings’. The epically titled ‘KFC City 3099: Part 1: Toxic Spill’, whose track titles allude to metal cops and mutant churches, sketches a soundtrack for dystopia as it looked from the wrong end of a fast food and B-movie binge in the late 1980s. That era’s trashy science fiction and cyberpunk narratives - The Toxic Avenger, Class of Nuke ‘Em High - bubble out of the landfill site we’d recklessly forgotten about, gleefully panicking about the social and biological effects (benefits, perhaps) of anarcho-capitalism and unnaturally polluting technologies on the youth of today, garbage upon garbage. Ferraro is a pop artist in sound and words, and there’s no knowing what is real and what is hyperreal in his strangely ersatz but ominous universe. I asked him about the future of Homo Sapiens as he kicked back in one of Los Angeles’s many coffee-and-WiFi communes. AH: What do you think pop music will be like in a hundred years' time? JF: The style of what pop music is seems to be in a symbiotic type of relationship with technology. So if technology stays on its track towards completely augmenting society and the world beyond, I think we will probably see a kind of hyperreal impressionism in popular music, art, cuisine and other areas of culture. AH: Your work has often shown an interest in technological alteration and augmentation of the body, too. How will future technological development affect our bodies and the way we use them? JF: There is probably a model for the 21st century Vitruvian Man walking around right now, with an iPad tablet in his hand walking around the streets of NYC as Plato 2.0. Humans seem to have always used their bodies as expressive instruments. Perhaps we will just continue to do that by adopting more appendages, like iPhones, Crocs etc., that represent a certain ideology that is expressed in the manufacturer's aesthetic and/or mission statement. By adopting these appendages we will be making gestures towards being eco-friendly, health conscious or what have you. And we will be using our bodies to express our fondness for these products and what they represent and in so doing we will proliferate our own culture of consumerism by being advertisements for the very products that reinforce our little ethical sub-cultures. AH: Will our species overcome the pollution - radiation and toxicity - we generate? How? JF: Maybe homo-sapiens will overcome toxicity by evolving into a global teenage mutant ninja turtle tribe. We will probably develop a shape that dodges radioactive waves easier. You'll probably be able to buy an artificial skin that deflects radiation. Maybe we will be forced to rebuild our civilizations underground, waiting for the sky to clear up again. But I'm an optimist. I hope this is just a passing phase. I'm hoping that one day we will enjoy endless text messaging and free online information without the risk of cancer and other mutations. AH: Are teens or young people better at looking to the future than their parents are? Does the future emerge from youth culture? Subcultural tribes? JF: I don't know, I think in the fairly recent past subcultural movements like the summer of love had been commodified and perhaps perverted into a weird cultural mainstream that we now occupy. Like role-enforcing degrading tribal tramp stamps that reference Flower Power's message of love. Dante Alighieri was something like 50 when he sparked the Renaissance so I wouldn't say young people are better at imagining the future but I would agree that it takes a kind of spirit that is maybe related to a youthful kind of optimism to see beyond the normal modes of your time. But this way is just my personal preference as I do think we can have a "mature" cynical happy functioning Utopian society of the future as well, so I don't know. AH: Music has often been compared to time travel, and music critics have noted a nostalgic quality in recent music. How does music relate us to the past, present and future? JF: You can use music to gain insight into the social issues of another time, hear the systems of thought of a past era. To clean your house, cook to or compose a symphony for super man propaganda films. I think it's obvious that music can express whatever ideas we want it to. Nostalgia to me is the wealth of an advanced civilization, a luxury. And in our 21st century world we find that we are over-abundantly rich with a collection of documentation of the preceding years, it seems very obvious to me that these things would be gathered as a kind of hyperreal material for artistic expression just like early humans gathered clay for their primitive creations. I haven't heard any worthwhile conversation on this matter though. Critics seem to have gotten lazier, more interested in helping to generate a buzz and take part in a public circus of self worship than actually helping the world understand itself and sculpting out the significant works of our time. AH: Is it better to be idealistic or realistic regarding the future? JF: I don't think we're able to distinguish the two from each other. At least from where I am located right now. as a citizen of a globalized city. Idealism and realism exist in a swirl, they bounce off one another repeatedly in a paradigm. This is represented in the commercial architecture of our time. It's obvious to think that it is purposefully designed to do so. Being first a building and second a place of consumption. But I know it is less intentional than that, which tells me we are unaware of our real time behavior as a whole. I personally like the liberation, it says that things can co-exist sticky and confusing but none the less open for modern-minded humans to adjust to. AH: Should we be afraid of the future? JF: I'm at a coffee shop, co-oping in the shared pleasantness of other MacBook users via our united wi-fi provider. This safety zone is a glimpse into the future. a look into a small group of espresso drinkers who believe in a digital Utopia. We have crocs on, Alpha Generational babies in slick ethno slings. Human-like domesticated pets. Eco-friendly plastic cups. These people represent a determinism that is informed by commodities. But there is room to dream somehow. I definitely don't fear them. I'm applauding them. Having abandoned ultra-lo-fi eighties junk music to soundtrack digital consumerism in the age of personal electronic devices with Far Side Virtual, James Ferraro has swerved once again with this free zip file downloadable from a new Tumblr page. It’s the first time Ferraro has used a pseudonym since 2009, a change that probably reflects the distance between this surprising collection and his previous work. For while Inhale C-4 $$$ is just as hi-fi and colourful as FSV, its mood and conceptual stance is something new to decipher. Ferraro has typically used sonic or cultural noise to impressionistically portray American lifestyles with ambiguous degrees of fondness and cynicism (for all its hi-def complexity, FSV was no exception). Here we initially seem to follow this pattern, with Ferraro setting his sights on contemporary hiphop and R&B’s subculture of swag and cash money with a series of laptop instrumentals. Ferraro ably generates sly, blinged-up melodies, robust beats and even tags the tracks with a helium-voiced audio logo. But Bebetune$’ degree of imagination exceeds mere satire and achieves a darker victory, catalysing the alien-modernist seed in contemporary hyperculture until you are frightened to find yourself seduced and converted. Digital manipulation of vocals in recent hip hop and R&B is pushed beyond gimmickry and becomes a completely new instrument, or else an entire texture composed of superhuman sirens. Extrapolating from the sonic sheen of figures like Terius Nash and Nicki Minaj, Ferraro now finds himself in the sort of twinkly territory occupied by psychedelicising dance producers like Rustie and Jam City. “Maccau Celebrities” fuses a sweet song-without-words R&B melody to a formidably bizarre throaty riff, while the final tracks are so picturesque and transcendental that there couldn’t possibly be any sarcasm involved – could there? Listen to Inhale C-4 $$$$$ below. More thoughts on Ferraro to come later in the year hopefully.